—Bela Fleck: Perpetual Motion (I’m fudging with this one, which isn’t jazz but is full of fresh ideas from Fleck, Edgar Meyer, Evelyn Glennie, Joshua Bell and others). The CD is “A British Jazz Extravaganza Recorded in Concert.” I only have the MP3, not the CD. Who plays on this particular track? Perhaps the wildest of all PCs. Hiromi and her electric band. Interesting how most of these recordings are made by piano players. Where are the saxophonists or trumpets who are willing to jazz up a Goldberg or a Brandenburg, even a Canon? 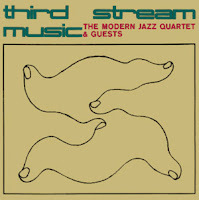 * John Scherrer adds the Classical Jazz Quartet (Kenny Barron, Stefon Harris, Ron Carter, Lewis Nash) and its recordings, which include The Classical Jazz Quartet Play Rachmaninov; notes that Ornette Coleman has long played the Bach Cello prelude in G (a version is available on his 1995 release with Prime Time, Tone Dialing); and lets me know that Sonny Rollins recorded Edward MacDowell's "To a Wild Rose." Thanks, John. Here's Coleman playing Bach. Glorious. * Reader Edouard Reichenbach adds Benny Goodman's delightful version of "Bolero," originally recorded in 78 rpm and now available on a compilation CD called Ravel's Greatest Hit: The Ultimate Bolero. Goodman pares it down to an economical 2:42. * Ed Reichenbach returns with more additions including Place Vendome, the 1966 collaboration between the Swingle Singers and the Modern Jazz Quartet. It's lovely. He gently but firmly chides me for neglecting the Swingle Singers. Not sure how I missed them, because I used to sing a Swingle Singers arrangement or two. If you enjoy vocal third stream music, the Swingles are for you. Their many jazz-infused albums of classical works include Bach's Greatest Hits, Going Baroque, Anyone for Mozart, Rococo A Go Go, Spanish Masters (Concerto d'Aranjuez), and Back to Bach, all recorded during the 1960s. Released in 1986, Anyone for Mozart, Bach, Handel, Vivaldi? is an excellent compilation drawn from their mid-1960s Philips Classical LPs. By the way, if you saw the movies Milk and Thank You for Smoking, you've heard some of their music. The original Swingles disbanded in the early 1970s; a London-based group by the same name continues the tradition (and, as Ed points out, adds beat boxing). Here are the original Swingles and the MJQ playing Bach's "Air for G String." try http://www.amazon.com/gp/product/B000294TO2 and you'll get a few tracks of jazzyfied Bolero. There's also a little bit of Jazzyfication of the Goldberg variations in http://www.amazon.com/New-Age-Bach-Goldberg-Variations/dp/B00000DP5E, although including that one in "third stream" is arguably a bit far-fetched. 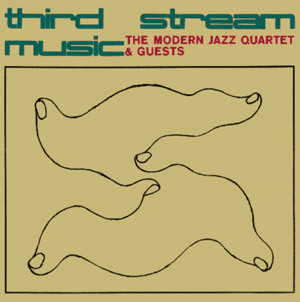 It would be "fourth stream". Do you know why John Lewis calls his impros on Bach's Goldbergs "The Chess Game", giving each impro the name of a chess movement? Is it pure gimmick or is there a true musical rationale to it? My CDs come without liner notes in one, and in Japanse in the other: no help. Thank you, Edouard! I didn't know about Benny Goodman's version (from "Ravel's Greatest Hit") and have now added it to my library (and this post). It seems that Spiegelman's "New Age Bach" has been rereleased (2009) as "Bach-Spiegelman: The Goldberg Variations: A Digital Transcription." I sampled that and think I'll stick with my old "Bachbusters" (Don Dorsey) and "Switched-On Bach" (Wendy Carlos) recordings. I have no idea why Lewis used "The Chess Game" and "The Bridge Game" as titles for his Bach recordings (although "The Bridge Game" does include liner notes, written by Lewis, he never explains the title). Like you (I found your review on amazon), I've done some Googling and come up empty. I'll throw the question out to my Facebook friends, which include many musicians, and see if I get a response. thanks Pamela. You don't seem to mention Place Vendôme, the collaboration between John Lewis/The Modern Jazz Quartet, and the Swingle Singers: there are three tracks of Bach and one of Purcell, plus three tracks of original Lewis but Bach-inspired compositions. In fact, you should include many albums of the Swingle Singers: the original, Paris-based group from the 1960s and early 1970s added a drum and double-bass accompaniment to their arrangements of Bach, Mozart, Vivaldi and so jazzyfied it, to really (IMO) beautiful and exciting results. The later (and still in existence) London-based group still does that, only they now vocalise the drum and double-bass. In fact, they've gone further than jazz and now "discophy" or "beat-boxify" the classics: try their album "Beauty and the Beatbox" and their arrangement of Walter Murphy's arrangement of Beethoven's Fifth. So how would you dub this new genre: Fourth Stream ?